With the pain of shingles a fading memory, I was back. Feeling ambitious, I was looking for a few fun things to do over the weekend before “spa day” numero tres tomorrow. Friday saw decent temperatures and I was feeling strong, so I decided to see how it felt to get on my bicycle. It’s important for me to stay as active as possible throughout chemo, and since my indoor exercise bike is not all that exciting, especially after a winter like this, I was beyond ready for some outdoor exercise and fresh air!! A bit uncertain about how my upper body strength would handle the bike, I started out cautiously. That didn’t last much beyond the alley, as I was feeling strong and confident. Comforted by Andy’s encouragement, I felt like I could ride without any problems. It felt wonderful pushing the pedals through Estabrook Park. I made my way comfortably to a favorite spot along the river, where the rapids were flowing with that soothing sound that rejuvenates me. We sat at the overlook by the beer garden (no, it’s not open yet, but I will be there as soon as it is… who’s in? Melissa? Marty, with your cold, spring birthday parties? ), taking in the sunshine and the scenery. We got a nice walk along the river before getting back on the bikes to head home. These are the things in life that are the healing moments for me. The bike ride felt so good, that I decided to skip the baby steps. On Saturday, I got the motorcycle out of the garage. Cautiously at first, again, until the end of the alley, and again, with Andy there in case I needed help, it felt remarkable to get back on the bike!! Andy was a little worried, and wanted me to go up and down the alley and leave it at that, but that didn’t sound fun at all, so we decided that a ride to the new Sprecher restaurant at Bayshore to meet his mom for lunch wouldn’t be too far for a first time out. I felt so good, that I couldn’t stop smiling and bouncing up and down every time we came to a stop light! After lunch, we headed to the lakefront for a cold photo-op near the water. Getting on my bike was a huge milestone for me. 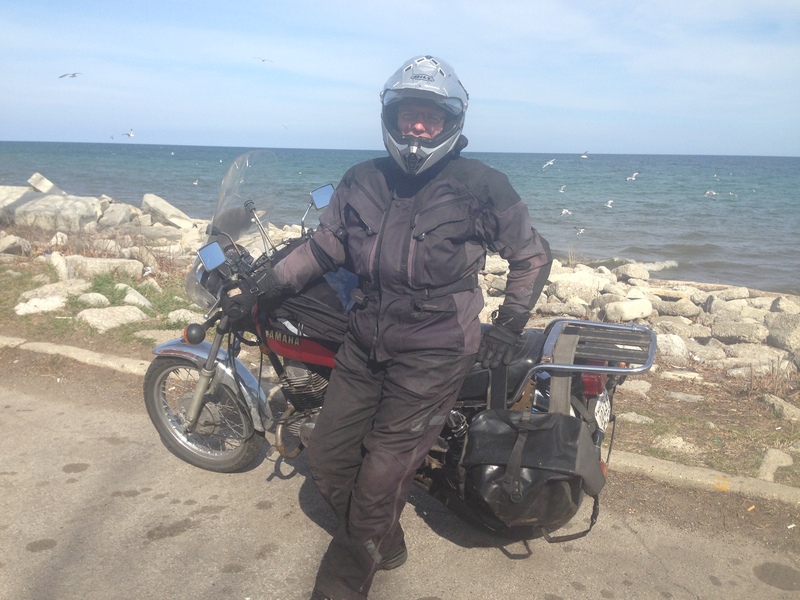 When I first heard my diagnosis and the dizzying array of surgeries and treatments which I would be enduring, I did not think I would ride my motorcycle until the fall, if at all in 2014. 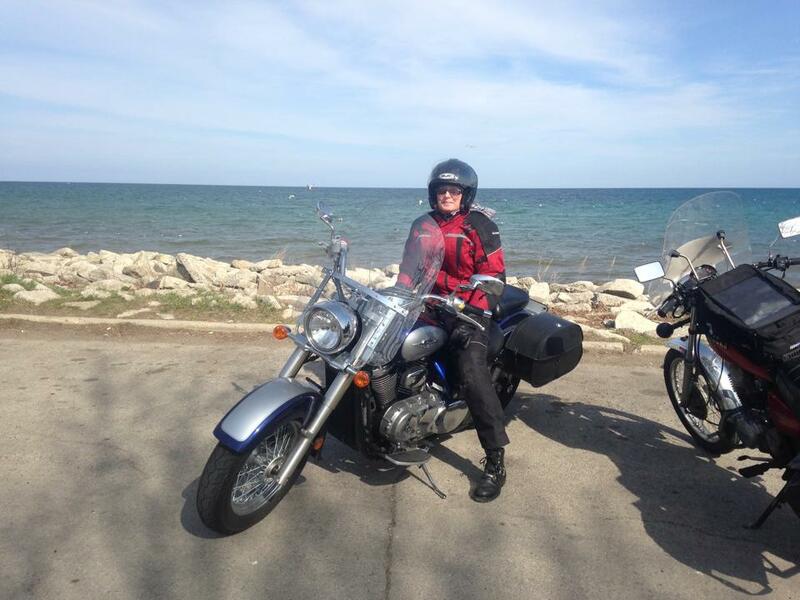 I had plans for weekend motorcycle trips with friends that would have to be postponed. This made me very sad, because being on the bike is my throttle therapy!! It always cures what ails me and provides me with such joy. The thought of leaving the bike in the garage all summer was even more depressing than a cancer diagnosis. I am committed to getting stronger through this, continuing to do the things I love to do! Now I feel confident that my goals are not out of reach. 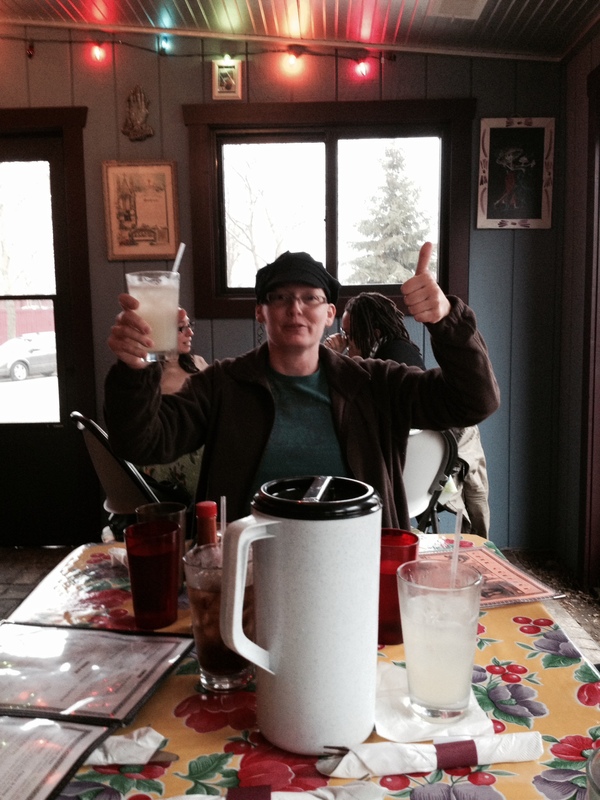 Oh yes, and I can’t forget the one margarita, which I had on Sunday. Here’s to hoping that the third verse is not the same as the first! Round 2 had been relatively uneventful through the first week. I had none of the long list of side effects that I was bracing myself for based on my experience with round 1. This time, I didn’t get any of the flu-like symptoms or the bone pain. I felt pretty much like myself, except, perhaps, a bit more run down than normal. That could have been attributed to the fact that my white blood cell count bottomed out near zero again. My theory is that maybe I did, in fact, have the flu during round 1. My nurse’s theory is that the first round can be the most disruptive because the drugs are killing off cancer cells, which, in turn, throws the liver and other organs into overdrive to rid the body of cancer and toxins and all the rest. I like that theory, I suppose, since my goal is be cancer free at the end of this road. I went for my weekly blood workup on Tuesday, when we found that my white blood cell count was, once again, very low. I received the usual warning about staying away from public places and sick people. I was also developing a cough. This was frustrating because I thought I had made it through the winter without a single cold or cough. This is remarkable for me, actually, because every year I end up with sinusitis or bronchitis or some other itis. 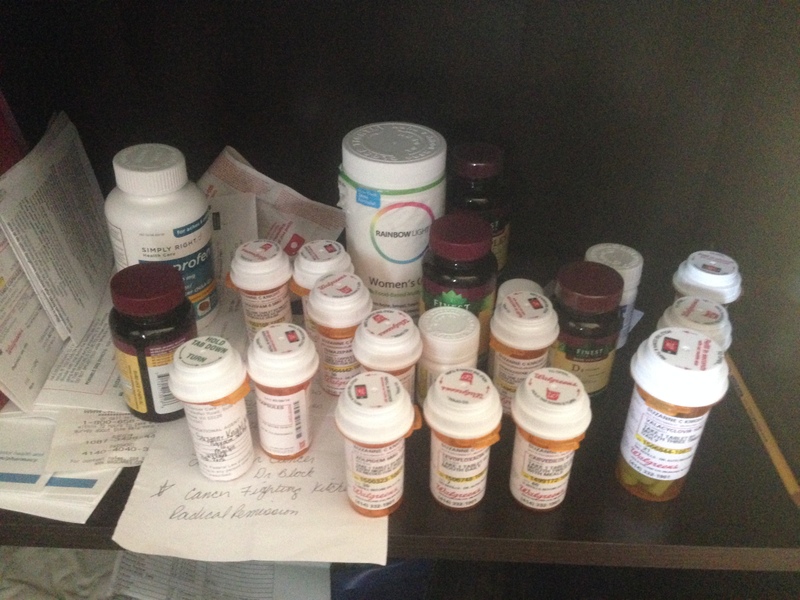 By Friday, the cough was getting really bad, so I called the nurse and got the necessary meds, adding to the bucket of meds already devouring an entire shelve in my room. My parents came over to help with the kids and run some of my errands, so I could get some rest. All seemed alright. But then, around 4:00, I reached up and felt a searing pain in my side, near the scars where the drains had been in place after the mastectomy. I was immediately concerned because I had finally been pain-free. In fact, I was doing so well that, on Tuesday, my physical therapist gave me rave reviews and told me that I was healing so well that I would only need to come in occasionally (and she started recruiting me for next year’s triathlon team of doctors, therapists and breast cancer survivors). I raised my shirt to find my side swollen and painful with a red, blotchy rash. I called the nurse right away which started a run-around of telephone conversations with various doctors and nurses. Mind you, this is 4:00 in the afternoon on Good Friday. First, I spoke with the oncology nurse. She advised me to call the surgeon. The surgeon put me in a panic. Her first thought was that the tissue expander had become infected. She advised me that this would mean emergency surgery to immediately remove the expander. Tonight. After that statement, she said she didn’t want me to panic, but that I needed to call the plastic surgeon right away. Okay, at this point, I started crying. Thoughts about my holiday weekend plans with the kids, not to mention the fear of a huge set-back requiring yet another surgery and recovery which would, in turn, delay the time-frame of the crucial, cancer-crushing chemo, overwhelmed me. Tears, hugs from my mom and kids, deep breath…. I placed the call to the plastic surgeon. “He’s in surgery right now, can I take your name and number?”, said the receptionist. Sure, no problem. I called the first surgeon back and she agreed that I could come to her office so she could take a look at my side and help me determine what I needed to do next. It is now 4:45 on the Friday of a holiday weekend. I am SO grateful for the dedication my doctor has repeatedly exhibited. She took one look at my side and said, “you have shingles”. The good news is-this is NOT a surgical problem. The bad news is, I was now in the wrong office. Dr. Tjoe placed a call to the medical oncologist, and together they decided that it was time for me to go to the Emergency Room. Hmmm. Could that have been because it was now after 5 on a holiday weekend? Regardless, I made my way down to the ER. The nurse there was completely confused as to why I was there. We chatted, reviewed the chart and determined that it was the intent of the doctors to have me admitted overnight to start IV antibiotics and watch me for pneumonia due to the cough. So off I went into a room for chest X-rays and more blood work. Wishing I had eaten something before I rushed off to see the doctor, I started fantasizing about the left over Chinese food back home in my fridge. All the tests were done and paperwork was completed to register me for a room. Waiting on results, and my room, I nibbled on dry crackers. Blah. It was getting to be close to 7:00, and boredom and hunger and sadness about my screwed up weekend plans was setting in. Just in the nick of time, my boyfriend showed up with books and podcasts (and a charger for my nearly dead phone) and hugs and good company. The wait suddenly seemed less oppressive. Then, rumors made their way to my ear that I might not have to be admitted after all!! The rumors proved to be true! My blood work all looked good, and they trusted that I would take the two additional prescriptions, add them to my bulging shelf, and take good care of myself at home. With my kids. And my Chinese food leftovers. The weekend was saved. And now I can check Shingles off my list, and it’s not even an itis. By the way, OUCH!!!! When I first told my kids that I had cancer, one of the first questions they asked me was if I was going to lose my hair. I think, for my oldest daughter especially, this was one of the most devastating effects. I’ve never been terribly vain, and was not too worried about losing my hair, because I knew it would be temporary. However, I am raising kids who are into hair, make-up, fashion and all things girly, and they were worried about me losing my hair. I’ve heard it over and over again, it helps to shave the hair off before the chemo makes it fall out in an effort to have some control over it. If that is the case, then I figured that I could involve the kids in the hair cutting to let them control the part of this that concerns them. Phase one was about 2 weeks ago, shortly after the first round of chemo. I made a ponytail close to my scalp and divided it in half. I let each of my daughters make a braid and cut it off. That was it. Two snips. We never evened it up or anything, and it was the best haircut I’ve had in a long time! I told the girls about Locks for Love. They thought it was cool that another kid could get a wig made out of my hair, so we shipped my two braids off to Locks for Love. After that, I let the kids dye my remaining hair purple, electric blue and crimson red. It was a fun look. People kept asking me if I really wanted to cut my hair before I knew it would fall out. My doctors and nurses were pretty confident that it would, since it was a big side effect of all three of the drugs I was getting, so I felt it was a safe bet. My physical therapist was the one who was spot on. She explained that around day 17, I would start seeing more hair shedding on my brush and in the shower. Then a few days later, it would start coming out in clumps. She explained that at that point, people usually shave it off. Sure enough, it started on day 16, as I ran my hands through my hair in the shower, hair was getting everywhere. Finally, I couldn’t stand it anymore, because, if I pulled on my hair, big clumps were coming out, and that part of it did freak me out a bit. So, last night, I put the electric razor in the kids hands again and let them shave the rest off. Right now, I match my hairless cat, Gizmo, with peach fuzz covering my head. It’s still actively falling out and driving me nuts, like when you just get a haircut and the hairs get in your shirt and itch like mad. Tonight, it all goes.